•Certified Organic Tamanu Nut Oil promotes the formation of new tissue, which improves skin's appearance. •Certified Organic Rosehip Seed Oil reduces the appearance of scars and facial lines and prevents the signs of premature aging. •Certified Organic Helichrysum is used to improve the appearance of scars, acne, dermatitis, stretch marks, boils and abscesses. •Certified Organic Neroli Flower Oil helps with the appearance of scar tissue and stretch marks and also prevents the signs of premature aging. •Certified Organic Pathouli Leaf Oil improves the appearance of dry, mature or wrinkled skin and is useful for inflamed skin conditions such as dermatitis, eczema and acne. •Certified Organic CO2 Flower Extract is an excellent anti-inflammatory useful for eczema, dermatitis and irritated skin. •Carrot CO2 Seed Extract is excellent for toning and improving the appearance of wrinkled, sun damaged and mature skin and for improving elasticity and creating a firmer, fresher appearance. •Certified Organic Rosemary Leaf Extract is a powerful antioxidant, preventing damage by free radicals. It is renowned as a rejuvenating tonic and is said to prevent the signs of premature aging. 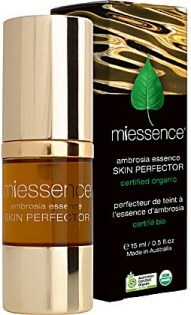 Miessence Certified Organic Ambrosia Essence Serum is simply the best natural skin treatment and is energized with the vitality of clean (pesticide-free) and potent ingredients, using only certified organic cold-pressed and unrefined oils and therapeutic grade herb and flower extracts freshly pressed from certified organic fruits, nuts, seeds, herbs and flowers, retaining all the vitamins, minerals and other bioactive nutrients. Miessence all natural facial products contain absolutely NO synthetic detergents, artificial preservatives, colors or fragrances, petroleum by-products, tar derivatives or genetically modified ingredients. Nor are any ingredients tested on animals. Use daily to revive and restore your complexion. Pump a few drops of the oil onto your fingertips and massage into the affected area until completely absorbed. Can be used on its own as a treatment or as a serum, over Skin Conditioner and Moisturizer for a super-intense nourishing booster. Day and/or night. Size: 15 ml. / 0.5 fl.oz.